Spiritual life, families or sport – HafenCity’s varied social infrastructure covers everything. New facilities are evolving and the existing ones are growing with the new district. HafenCity’s ecumenical chapel is a little hidden away. But once the right door in the seven-storey red-brick building in Shanghaiallee is opened, the visitor leaves the busy activity of the neighbourhood behind and enters a place of stillness and contemplation. The circular interior of the chapel is plain but has a grandeur of its own; the principles of the Charta Oecumenica are printed in golden letters on its doors. The chapel is part of the building of the Ecumenical Forum Hamburg which was inaugurated in summer 2012. With its undulating façade decorated with an inset cross and a bell, it only subtly resembles a sacred building. It was built by an alliance of 19 churches which came together in an initiative that is unique in Germany. Distributed through the four upper storeys are 26 apartments for multigenerational and communal living; one third of them are publicly subsidized. There is plenty of space for encounter: the menu in Weltcafé ElbFaire includes fair trade products and the special lunch menu attracts residents, people working locally and tourists alike. Lectures and discussions are held in a large, light-filled room. "We want to make our contribution to a modern, liveable city district," says the pastor, Antje Heider-Rottwilm, head of the Ecumenical Forum HafenCity, known as the “Brücke” (bridge). "We are committed to people who need our help, to sustainability and social justice." The bell for 15 minutes of midday or evening prayers rings on five days a week. The chapel also offers contemplation as a Christian form of meditation and "healing singing" which "opens the body and soul to spiritual experiences". Before taking possession of the new building, the Ecumenical Forum was already represented in HafenCity with a temporary chapel. This was dismantled after the move into the new domicile. But the social infrastructure, altering and expanding as the district grows, serves more than just the spiritual needs of the meanwhile 1,800 residents of HafenCity. The location also offers plenty in terms of family appeal. Since 2009 Katharinenschule primary has performed a pivotal role here. This all-day primary school with its unusual roof-top playground is the humming focus of Am Sandtorkai/Grasbrook neighbourhood. Integrated into it is an after-school centre for schoolchildren and, in the next-door residential building, a nursery and kindergarten for HafenCity’s youngest population group. Represented here also is pme Familienservice GmbH which provides a back-up childcare service for employees of local companies as a stop-gap and offers especially long opening times. If necessary children can even be looked after around the clock. There is no closing time or closure for holiday periods. "We are especially in demand if a babysitter is sick or a crucial work appointment crops up unexpectedly," says Margit Werner, head of Familienservice – operating all over Germany – in Hamburg and the north. 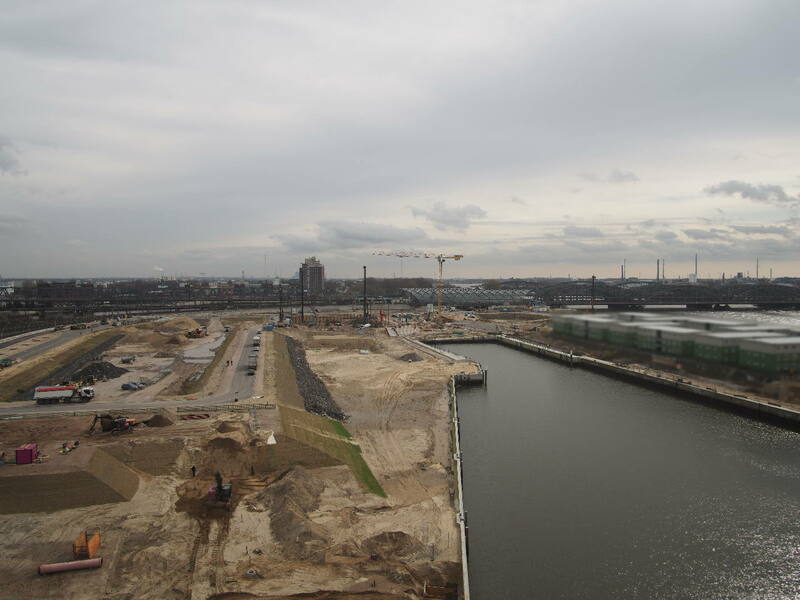 pme Familienservice wants to expand its facilities in HafenCity and already has concrete plans: in 2014 it will be opening another day-centre at Lohsepark in cooperation with a city-run children’s day nursery. “It will be a great boon there to have that huge green space in front of the door,” enthuses Werner. Four new childcare units in total are planned for Lohsepark and Grasbrookpark. HafenCity will also have a secondary school (gymnasium). The gym in Katherinenschule is not only used for school sport, but also by the sports club Störtebeker e.V., which is based in Oberhafenquartier. Its chairman Manfred Jürgensen is also pleased to have more than 60 children as members, divided into four different age groups. Courses on offer include children’s dancing and karate. “For adults we also have karate and on Saturdays there is recreational football,” adds Jürgensen. He worked in the port for 35 years and is now working as a volunteer for the new district. He continually manages to find new and creative ways of widening the range of sport on offer. For instance, he has an agreement for the club with Gruner + Jahr allowing members to use the publishing house fitness studio on Baumwall for a moderate fee. And Störtebeker e.V. also plans to grow with HafenCity. "As soon as there are more sports grounds and halls, we will expand," he explains.